It's not every day that Mayo Clinic ends up in the pages of Fantasy Baseball Crackerjacks. Throw in MLB.com, SBNation, the Bleacher Report and Sports on Earth, along with the sports sections of any reputable (according to us) sporting news source, and you've got a buzz that only a Minnesota Twins news release and a previous Major League MVP could create. That's just a taste of what happened after Joe Mauer and the Twins consulted with doctors at Mayo this offseason and considered the health and longevity of the team's star -- a three-time batting champ, MVP and six-time All Star, who suffered a season-ending concussion on Aug. 19 and has battled other injuries and infirmities over the last few years. Ultimately, they decided it was in everyone's best interest for the Gold Glove-winning catcher to make a move to first base. The Twins didn't offer a lot of detail about how that consultation went down, but they certainly placed Mayo's name prominently in their news release, emphasizing the medical nature of the decision. We couldn't think of a better way to make the point than by emphasizing that experts at the home state's top medical center were consulted. Mauer, it seems, wouldn't argue. "With our training staff, our doctors and the Mayo Clinic, they were the best around," he tells Sports on Earth. "I didn't need to go anywhere else to gather more information." Of course, when we think about Joe Mauer and Mayo Clinic, we can't help but recall the image of Joe Mauer racing a young patient down the halls of Mayo Eugenio Litta Children's Hospital during a visit to Mayo with fellow Twins players back in 2012. Mauer's Mayo Clinic connection goes back even farther than that, however. He went public about coming to Mayo while battling troubling leg weakness issues back in 2011. 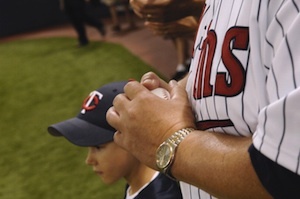 And during Twins games at Target Field, he's been surrounded by Mayo Clinic's health messages during home games for the past few years now as part of Mayo's partnership with the Twins. This may be the wrong time of year to be thinking about hanging out at the ballpark, but then there are only 90-some days until pitchers and catchers report to spring training. We're guessing Mauer won't be far behind even if he doesn't have to show up till a few days later this year. Report to us and share your comments, 2014 predictions and other fantasy thoughts below.